• Designed to bring you into the early ice climb season already fit for mixed climbing trips. 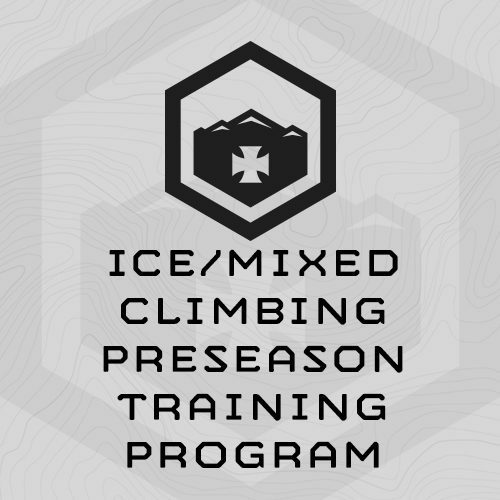 This 6-week training program is designed to prepare athletes sport specifically for the ice/mixed climbing season. It assumes your climbs will have relatively short approaches. The program trains your 4 days/week (Mon-Thursday) for a total of 24x training sessions and is designed to be completed directly before your first ice/mixed climbing trip. It can also be used during the season to increase/maintain your between-trip ice climbing fitness. – Train your “sport specific” ice/mixed climbing grip, core and calve strength, work capacity and stamina. – Build your “Mountain Fitness” – legs, lungs, core, and overall work capacity for approaches and long mountain days. How is this program different than your Expedition Ice/Mixed Climbing Program? This program is designed to prepare athletes for ice/mixes routes with short approaches – day trips. The Expedition plan is designed to prepare athletes for long, multi-day trips in Alaska, the Canadian Rockies, etc. Sandbag - Men will need a 60# sandbag, women a 40# sandbag. You can make your own sandbag out of a duffle bag and fill with wood pellets, sand, mulch made from ground up tires, etc. We also sell sandbags at our website. Dumbbells - Men will need two pairs of dumbbells, 25# and 35#. Women will also need two pairs of dumbbells, 15# and 25#. Bench/Box/Stool for Step ups - You’ll be doing thousands of step ups during this program and will need a 16-18 inch box, stool, bench, tire or something to do step ups on. Our step up benches are 17 inches high. 25-Pound Backpack - you’ll do the step ups loaded with a 25-pound pack. Use rocks, dumbbells, or whatever for weight. Pull up bar - You’ll need a pull up bar for pull ups and chin ups. System Boards - We train your sport specific grip strength by having you hang and do intervals using your ice tools on a system board. The minimum sized system board you’ll need is a 4x8 sheet of plywood set at a 25 degree angle. You can use common rock climbing holds with your tools, and also hardware such as old door hinges, door bolt brackets, eye bolts, etc. We use both. While one 4x8 sheet of plywood is the minimum you’ll need to complete this program, space and cost allowing, we’d recommend you build at least 2 system boards - one at 25-degrees, and one at 45 degrees.